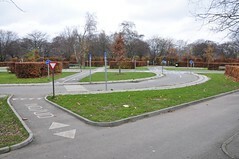 In 1974, a Traffic Playground opened in Fælledparken, Copenhagen, giving children the opportunity to hone their skills riding bicycles and interacting with other traffic users. 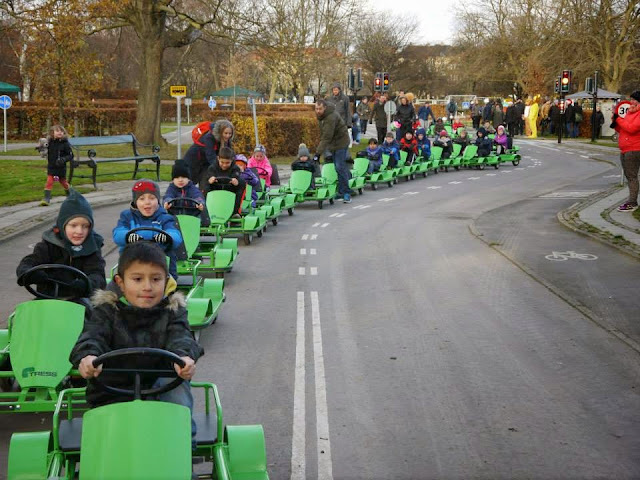 On November 29, 2014, the Traffic Playground reopened after being renovated, in time for the 40th anniversary. 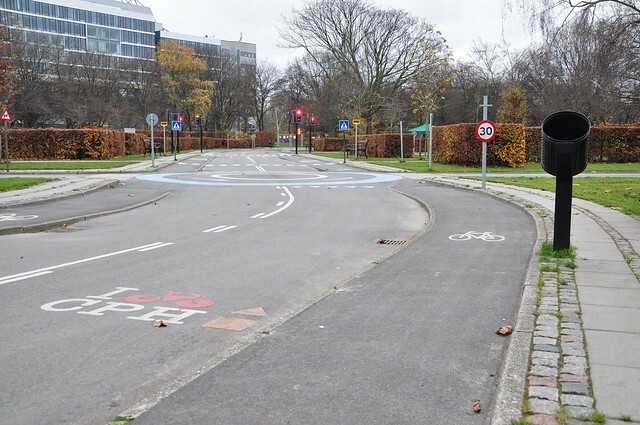 Such traffic playgrounds have been commonplace in Denmark and the Netherlands since the 1950s and go hand in hand with the fact that the bicycle has been on the curriculum in Danish schools since 1947. Children recieve their first taste of bicycle “school” in the 3rd grade and, in the sixth grade, they complete a bicycle exam. 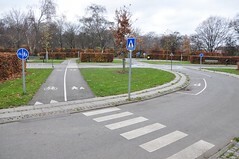 All the facilities at the Traffic Playground in Copenhagen were renovated. New asphalt was laid down and everything else was shined up. 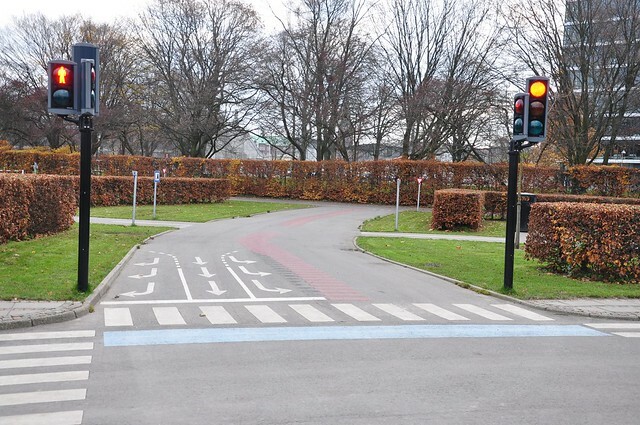 Safe traffic learning is really prioritized in Denmark and, of course, our kids deserve the best conditions. The traffic playground is a public playground with a “kid-sized” traffic town where children learn to move in a safe environment. The playground is staffed during business hours and children can borrow go-carts, pedal vehicles with trailers and small bikes. The children are also welcome to bring their own bikes, roller skates and scooters. For younger children (2-5 years), there is a small, fenced traffic lane where the little ones can borrow carts, tricycles and bicycles with trailers. Furthermore, the playground has a garage with go-carts, which are intended for children between 5 and 14 years. In the classroom, children can receive classroom teaching. The traffic playground consists of small roads that wind in and out between lawns, shrubs and trees. Everything on the small rehearsal roads is reduced in size to match the children's perspective. There are mini signals, driveways, road markings, sidewalks, crosswalks, bike paths, a gas station, a roundabout, bus stops, traffic lights and even trash cans tilted towards the cyclists - just like in real life (you can see one here in this earlier article). Every aspect of traffic in a city and a suburban area is present. Kids switch between being cyclists, motorists and pedestrians in order to learn from the different angles. Living in a city like Copenhagen, it’s really useful for kids to be taught in how to interact and signal in traffic from a young age. By the age of six, many children ride to school, and therefore you can’t start the practicing soon enough. During our every day cycling in Copenhagen we see that the young ones excel at riding bicycles and interacting with car and motorcycle traffic. All cities can certainly learn something from that. A facility like this fits perfectly in our idea of what a truly life-sized city should be. The traffic playground caters to schools and kindergartens, as well as other organised groups and parents are welcome to stop by with their kids. Photo from the reopening - courtesy Traffic Playground and their Facebook page.